Originally published in Socialist Worker, March 27, 2014, Editorial. That’s the slogan for the Global Climate Convergence, a campaign of education and activism set for later this month, with 10 days of action running from Earth Day on April 22 to May Day, the traditional holiday celebrating workers’ struggles. [T]he movement for democracy and justice is sweeping the globe–from democracy revolutions to Occupy protests, movements for the rights of workers, students, immigrants, women and Indigenous peoples; resistance to NSA spying, endless war, prison pipelines, tar sands, fracking, nuclear power, GMOs and more. The accelerating climate disaster–now predicted to dismantle civilization as we know it as soon as 2050–intensifies all these struggles, and provides new urgency for collaboration and unified action. Clearly there is no time to lose. Some people might write off talk of an “accelerating climate disaster” that will “dismantle civilization” as Doomsday paranoia. But a recent report by the National Science Foundation’s Safa Motesharrei, funded in part by NASA’s Goddard Space Flight Center, makes the case that rampant inequality and overconsumption, in the form of wholesale resource extraction, pose exactly this threat to modern civilization. THE GLOBAL Climate Convergence–and the spreading ecology movement in general–have taken on increased significance in the wake of a push by those at the top to approve the Keystone XL pipeline. Final approval for the controversial Keystone project–which would carry dirty tar sands oil from Alberta all the way to the U.S. Gulf Coast, for refining and export–has been steadily inching forward. An environmental impact report from the State Department earlier this year appeared to clear the way for a final green light from Barack Obama–despite the chorus of opposition demanding that the pipeline project be stopped because of the threat it poses to the environment. It’s a testament to the organizing efforts of dedicated activists in the U.S. and Canada that final approval for the pipeline has been delayed for as long as it has. Obama has more than enough information to conclude that the Keystone project would contribute significantly to the already dire impact of climate change. But he is being urged by a bipartisan chorus of politicians, as well as powerful business interests, to sign off on the pipeline anyway. These voices have become even louder following the developments in Ukraine, particularly Russia’s military intervention–with demands that Obama green-light the pipeline to “send a message” to Russian President Vladimir Putin about U.S. energy independence and national security toughness. But Obama hasn’t needed much pushing. The once-upon-a-time presidential candidate who promised a “windfall tax” on oil companies and a new era of environmental protection has, as president, pressed for increased oil and natural gas extraction as part of an “all of the above” energy policy that puts corporate profits first and the environment dead last. Increasing the energy supply in the country is an important thing for us to be looking at. All facets of it ought to be up on the table and ought to be talked about. If we have the ability to export natural gas without increasing the price or disadvantaging American industry in the process, then we should carefully consider that and adopt policies to allow it to happen and help, because God only knows we do need help with our trade balance. This is a profoundly shortsighted attitude that ignores the grave prediction of former NASA scientist Dr. James Hansen that approval of the Keystone pipeline would mean “game over” for stopping or even slowing climate change. Sadly, Trumka’s position accepts an old myth–one still accepted by many people–that environmental protections inevitably come at the expense of U.S. jobs. According to a March ABC News/Washington Post poll, two-thirds of Americans now favor approval of Keystone approval. The main reason they cite? That the Keystone XL will increase employment. In fact, 47 percent of those surveyed believe the pipeline poses a serious environmental risk–“but among those who see a risk, 45 percent support the pipeline anyway, apparently persuaded by the perceived jobs benefit,” according to ABC News. But is the conventional wisdom about the project correct? Almost all the new jobs will be temporary work in construction and manufacturing. Estimates put the number of permanent jobs created by Keystone at less than 100. More importantly, the narrow focus on the pipeline ignores the much larger number of green jobs that would be created right away by a systematic effort to transition the U.S. energy infrastructure away from dependence on fossil fuels and toward sustainable methods. 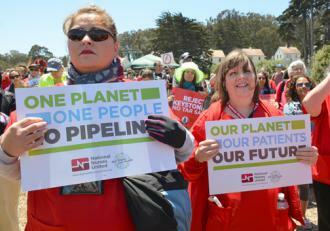 Some unions like the Transport Workers Union, Amalgamated Transit Union and National Nurses United are taking a stand against Keystone, pointing out the harm for the environment and working people alike in having a short-term view of the pipeline’s effects. This is true beyond the Keystone and tar sands oil–ecologically damaging processes like hydraulic fracturing don’t just poison the environment, but poison the air we breath and the water we drink. The Convergence calls for a solution as big as the crisis barreling down on us–an emergency green economic transformation, including full employment and living wages; 100 percent clean renewable energy by 2030; universal free health care and education; food and housing security; an end to deportations and mass incarceration; economic and political democracy; demilitarization; ecosystem restoration and support for the rights of Mother Earth; and more. BUILDING SUCH a movement will take time and energy, but it can be done. A new generation of activists has already begun to embrace the urgency of building opposition to the Keystone XL in particular, and the corporate and political policies that drive climate change in general. Recognizing that time is of the essence, these activists are pushing ahead with a militant attitude and tactics borrowed from social justice causes. Environmentalists on campus are pushing for divestment from fossil fuel companies. Primarily young people led the way with a mass civil disobedience action on the doorstep of the White House on March 2, in which nearly 400 were arrested. But the opposition to Keystone is also broader, bringing students together with local communities in the pipeline’s path, as well as Indigenous peoples fighting to prevent the destruction of Native lands. For example, the Cowboy Indian Alliance, which unites Native communities with ranchers and farmers in the Plains states, is mobilizing for days of protest in Washington starting on April 22. Meanwhile, more and more people are also coming to realize that the Keystone pipeline is just one more example of the environmentally destructive practices that persist, despite the threat of climate change, because they are most convenient to maximizing profits for the 1 Percent. The challenge to tar sands oil and the pipeline polluters must be connected to the struggle against the frackers and polluters of all kind–and beyond that to a corporate elite that treats workers as dispensable in every way. There is no alternative to discarding the theories and practices of capitalism, if we must save the Earth and its living systems. No amount of cosmetic reforms either in the center of the global capitalist system nor anywhere in its periphery can hide the most obvious fact today: At a time when humanity has the most profound knowledge and technology, the world capitalist system of private greed risks all our lives and the very Earth we live on. Mankind today is faced with one choice: abandon the capitalist system or perish by it. As the ecosocialist coalition System Change Not Climate Change explains, “[A] change to the current social and economic system is the only way out of our planet’s ecological crisis.” Building a movement that can set its sights on such a change is more important than ever.